A backsplash is an important part of kitchen design for both function and style. Kitchens are messy places, and backsplashes not only protect your wall surfaces from the splatter of oils and sauces, they can also create an incredible visual impact in your kitchen. Choosing the material for your backsplash is the first step to creating a beautiful design. There are several options, from traditional tile to modern metal. Ceramic tile comes in a variety of shapes and colors, as does glass tile. Back-painted sheets of glass are another option for a more modern and minimalist kitchen, and much easier to clean than smaller tiles. For a more traditional look in your kitchen painted beadboard with a durable high-gloss paint is a great choice, while stainless steel and metal tiles are excellent for an unexpected and modern design. 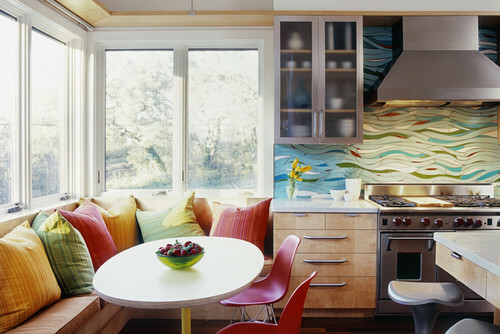 Most backsplash materials lend themselves to a variety of color choices. When you choose your colors, it’s important to always keep the conceptual design of the kitchen in mind. A backsplash can create contrast in your kitchen; for example, if your cabinets and countertops are a dark material, choosing a lighter color for your backsplash will help create that balance in the overall kitchen design. Alternatively, you can extend the color of your countertop into your backsplash or create an interesting visual impact with multiple colors of tile. You can add simple pattern to your backsplash in several ways. Choose a ceramic tile with an embossed design and use it as an accent, or a metal backsplash with an etched pattern. Even if you choose a solid color of tile, you can create pattern with the shape of the tile or just by layout alone. Installing tile on the horizontal is much more traditional and conservative than laying on the vertical. Take it a step further and stack the tile as apposed to a brick layout. What would you choose for the backsplash in your kitchen? Share your opinions with us in the comments; we’d love to hear your input! I agree with you. Everyone’s style is different and infusing the personal DNA is what makes e/ home reno project exciting. I have always liked your blog, thank you for sharing your expertise. I tend to make a mess when I cook specially when we feel like making some Mexican Food, yum! In that note I would love to hear your thoughts about using natural stone for a backsplash, as it is one of my favourite materials, but I am no designer and natural stone colors, patterns and finishes are some of of the great things about this architectural/ornamental material. Looking forward to hear from you.